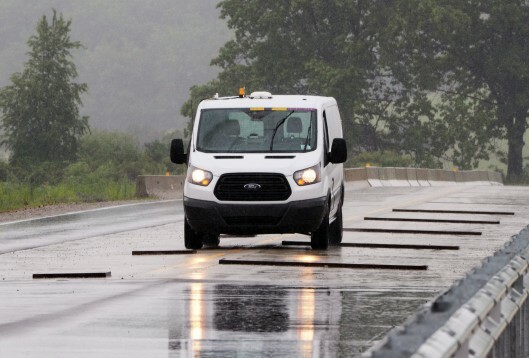 BRIGHTON, Mich. - Engineers at Ford's Michigan Proving Grounds have come up with the auto industry's first robotic test system, which drives trucks and vans across obstacles that put a decade of wear on a vehicle in ten minutes. With such destructive obstacle courses, robotic cars are now taking the punch for Ford Test Drivers. With robotics cars now taking the punch for Ford Test Drivers, this allows the researchers to put the vehicles through even more tortuous testing. The obstacles that the vehicle encounters try to destroy the vehicle, with the intention of shaking the vehicle to pieces. Test cars will encounter a variety of difficult obstacles, such as driving over cement blocks, rough gravel, mud pits, and giant speed bumps. According to Ford, all of it's vehicles are required to complete these intense durability tests before they are deemed fit to be sold. In the past, it would take longer for the vehicles to complete the obstacle course because it was potentially dangerous for the test drivers to be on the course for long periods of time. Some of the obstacles that are designed to shake the vehicle to pieces are considered to be dangerous to the driver if experienced more than one day. By replacing the driver with a robot, Ford can submit these vehicles to the most intense, dangerous driving conditions - all without risking the drivers safety. This accelerates the durability testing, allowing Ford to create more durable and safer cars at a quicker pace. At Ford, they work hard to make sure your Ford vehicle will run efficiently, and safely, for as long as possible. So stop in today at our Pinckney Area Ford Dealer location where we can show you our selection of Ford Cars For Sale. Not in the market for a new car? We can assist you with Used Car Loans to get you in one of our many great Certified Preowned Cars For Sale.